Okay, so far no smoke. And not from my kitchen, but from my computer. 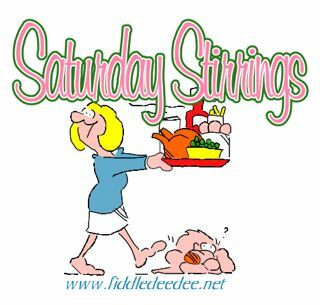 This is the first week I’m using Mr. Linky so that y’all can join me for Saturday Stirrings. My recipe this week will be short and sweet. Since all this technical cr stuff is frying my brain. This is a South Beach Diet snack idea. It sounds weird, but I LOVE IT! Personally, I could sit and eat an entire bag of Lay’s Potato Chips in one sitting, but if I want to continue to fit through my front door, I need to find a delicious alternative. Enter the garbanzo bean. Also known chickpeas. 1 Can (14 – 19 ounces) chickpeas, rinsed and drained. Bake for 50 minutes, or until browned and crisp enough to rattle. Makes 4 servings. My kids even like these. And I’ve never gotten them to go within 20 feet of a garbanzo bean before. In the Mr. Linky thingy, in the first box titled, “Your Name” enter your name and then in parenthesis, a very short form of your recipe. In the second box titled “Your URL,” enter the URL of the post you created. NOT the URL of your blog. Then click the little “enter” box, and your name will magically appear. On your post, link back here, and feel free to use my Saturday Stirrings graphic, if you’d like. And if you don’t have a blog, feel free to leave a recipe in the comments section. Clearer than mud, actually! Thanks! Chickpeas? I have some to sneak into choc chip cookies but I’ve never considered actually eating one. They look like swollen peanuts to me. Is this open to any type of recipe? Thanks for starting this! I had been wanting to share this recipe for a while but just hadn’t done it. This looks like fun! I will have to look into joining next week. Until then, I left something for you at my site. Check it out when you get a chance. Oh, I love this new feature, and even more that you’re going to let us play in the kitchen with you! I used to do a “Savory Sundays” post, but fell out of the habit long ago. I think I’m ready to get back into it, starting next Saturday. I bought some chick peas the other day at wallyworld. I guess that would be a good way to try to get them into my kids! I’m going to try the chick peas. Have you tried edemames? Those are great too. I’ve left you my recipe for Southern Cream Gravy. It is *guaranteed* to clog every artery you got, but it is SOOOO delicious and goes on everything…well, mostly. Thanks for doing this! I love recipes and once I have this baby I *completely* plan on cooking some of them! Ha. Chickpeas . . . who’da thought? Gotta try it out on my kids. Thanks!